The image to the right is from an article published in AlterNet. The article is titled, "It's Not Easy Being Green: Are Some of the Biggest Enviro Groups Giant Sell-Outs?" The AlterNet article begins with a salute to a powerful denunciation of the Sierra Club, authored by Maura Stephens. Stephens very correctly, in my view, deplored the Sierra Club's behind the scenes decision to accept money from an energy company that has been pioneering fracking on the East Coast. In fairness to the Club, though this fact didn't convince Stephens to cut it any slack, these secret contributions to the Sierra Club did occur under a previous Club administration. Still not a pretty sight! 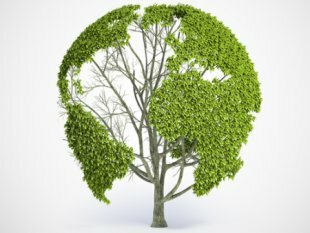 In further discussing the "internecine strains that appear to be intensifying in the green movement," AlterNet ultimately describes them as being based on a difference between "those who esteem nature for its intrinsic value and those who want to protect it for its instrumental value." In the context of my "two worlds" view of the realities we inhabit, this is a debate between those who value the World of Nature in and of itself, and those who value the "human world" above the "World of Nature," and see the "Natural World" as important mainly because of what it can provide for our own projects. Since "our world" is ultimately and absolutely dependent on the World of Nature, the idea that we should protect the environment for its "instrumental value" is just plain wrong. Which side do you think God is on, in the debate about whether an "intrinsic" or an "instrumental" view of Nature is the right view to have?